"This is the easiest and yummiest pie recipe. Handed down from my granny!" In a large mixing bowl, combine blackberries, sugar and tapioca. Be careful not to damage the berries. Pour into pie crust. Cover with top crust, seal and crimp edges, then cut slits in the top for steam vents. Top with pats of butter. Bake in the preheated oven for 30 minutes, or until golden brown. Good, but put the butter UNDER the top crust and when you mix the filling add a pinch of cinnamon. Also, don't use the pearl tapioca. It's too big. 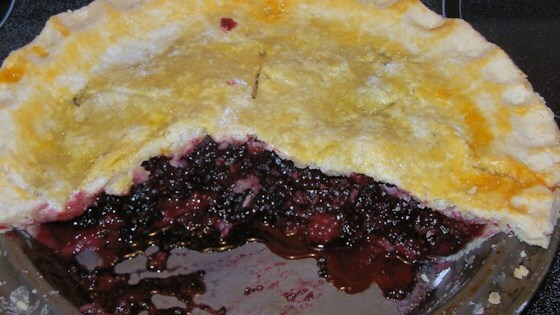 This is the only blackberry pie recipe for me! Added a little lemon juice and cinnamon ~Perfect! This is the best and easiest recipe! To make the pie thicker, add extra tapioca, just estimate the amount. An excellent pie, the tapioca really added texture. Everything stuck together, sliced beautifully. I'll make it again!! !